I actually build a something like this for my own UI system, using the theora library and some old code I found in the forums. I wanted to put it to the marketplace actually, but it does not play audio yet, so you would need to play the audio externally with Sound:Play(). Also as far as I remember the quality was not that good, but maybe it was just because of the video conversion to ogg. Ok so I found a workaround for the issue. It actually works pretty good so far, still its not ideal, and I just tested it for a single non-prefab object with no parent, but it is at least something. A Physics:Refresh() function maybe would be a good idea? But thats just my unprofessional opinion. EDIT: @mdgunn Just saw your reply. Yeah my sentence was a little weird. I meant that with this method, all of my objects will have dynamic physics, and objects (like wodden planks) I place on the roof of a room will fall to the ground when mass is enabled. However as you can see above I found a solution, at least for the moment. Ah yeah the new cube I created in your scene had 0 mass actually. It does actually work with mass > 0. The problem is if I set mass to my scene object then it sometimes just falls through the ground (which by the way is why I did not set a mass), or it behaves like a dynamic physics object, which I not want, I maybe have some wodden planks at the ceiling and don't want them to fall on the ground ^^. Well I have different room layouts & different prebuild furnishing sets. A few rooms are preloaded and then everytime you exit a room an new one gets loaded and placed at the right position. This works in the first place, but I experienced that after a certain number of rooms, the collison of some objects are broken (so far just the furnishing objects, not the room itself were affected). Why not have the bits HAVE mass and sit them on an underlying 'scene floor' that does not move? Could you explain this a little more? As explained about arent my objects flying around with mass enabled? How would you created the scene floor and not make him move? Strange, I tried self.startPos.x + 5 instead of +1 and it goes back and forth multiple times fine still. or will end up creating something other than what was described. I attached a test project. Just open the start.map. If you press "K" the box moves and you can walk through the box. Now the question is how to move it without breaking the physics. If you upload an example I can try then I can determine what's going on. I mean the question still remains, how to change an objects position with static scene phyiscs after its placed in scene. I see no solution yet. I understand that it has to do with the physics engine not updating the new position of the object, but what to do against it? One other thing SetDebugPhysicsMode(true) on camera might show something but you've probably already tried that. Yeah I tried that, the physics shapes are in the right place. The weird is that in my actual setup the physics just break for models, but not for csg brushes, under different circumstances however, which are a little hard to explain right now, the csg brushes physics broke aswell. The above code sometimes breaks the newly spawned objects physics as mentioned earlier. Using a joint does not seem to be an option. I dont want my object to slowly move towards its spawn position. I could provide a test proejct, but the behavior can be reproduced so easily. Just take a csg brush, scene physics on, 0 mass. Now try to change its position & test the collision with a player controller. There is no motor so you don't have to worry about that. Yeah I just tried that because it did not work. Hmm I still can't get it work. What am I doing wrong? Shouldn't this code change the position of my object? Could you give me an example code how to move a physics object with this? 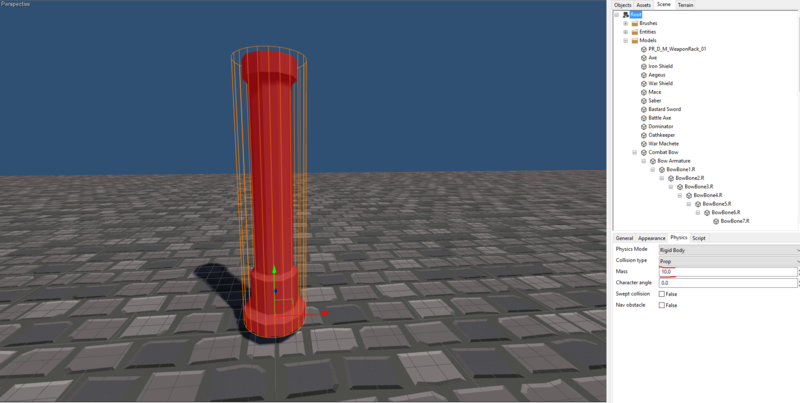 And does the object need a mass or specific collision setting? I can't find this in the documentation and it does not work, at least not with lua. (Its using my key manager so don't wonder) First my player collides with the csg box but after the SetPosition command I can walk through. I will try to work around the issue and examine this behavior. If I find a solution I will post it here. EDIT 2: I though Move was at least working, but if all this is not weird enough now if I use Move more then one time the physics get disabled again. EDIT 3: So the idea now was to first set the entities mass to something greater than 0 and then change it back to 0. If other to expect this did not work, something more weird is need to be done to make this work. The code below did actually work and I can now set the physics object position, but because the mass reset to 0 happens one update later the object can move a tiny bit through physics (I could decrease this to a minimum by using a minimal mass). Could be difficult to share, but you can easily achieve the same error I guess when creating a simple box with physics, make it a prefab, load it and set the position of it on button press. Then you just need something to test the collsion (e.g FPS Player). At the start the physics should work but if you change the position you should be able to walk through the box. But sometimes the error does not occur so you may not be able to reproduce it. I currently will finish some other aspects of my project and will come back later to this bug. Hope to gather some information here. I will try some stuff when I have time and maybe share a setup where the problem appears, however thanks for you answer. How to use the available material shaders? Ok thank you I tried it and it works, but is there a way to increase the radius/intensity of the emission? @Josh Thank you, good to know! I found the tessellation_example.mat which explains this shader so now I only need to know about how to use the parallax and env (which stands for enviorment map I guess) shader. Some example materials like the tessellation example for those would be a good idea I guess. Hi just want to report two bugs. I have version 4.5 beta. When I start Leadwerks it crashes sometimes with no reason and if I restart it, it just works. Leadwerks also crashes sometimes when doing something as simple as parenting two objects. I also heard this random crashing behavior from others and I think thats some of the larger flaws Leadwerks has and should be fixed. Leadwerks should at least do a backup save of your map when it crashes (I know there are normal backup saves). Second is something more precise. If you get a CSG brush via "FindChild" in lua and apply "SetScale" to it the application will stop running with no error message. Ah and now I remember one more bug. If you unparent bones/objects from an objects hierarchy in the editor and remove the main object, you can't remove the former child. Hope this helps fixing. Hope at least the crashing gets less with the final release of 4.5. I have all of my models in a Blender scene, where with the right plugin you can batch export them. This makes them basically available in any format at any time. With one click I can export hundreds and thousands of 3D Models directly into the Leadwerks Project. Sure it can take some time to place all your models in a Blender scene, but thats what a batch importer is for :D. Mabye this helps you. Although FBX is industry standard I am not a fan of it, as it is locked behind Autodesks paywall. It also does not work well with Blender which most Indies use I guess.